Too much news, good and bad, for one weekend. Bike the Vote LA has officially come out in favor of Carolyn Ramsay in the May 19th election for LA’s Council District 4, which they describe as crucial for LA cyclists. And as someone who lives in the district, so do I. Bike-friendly improvements can’t come soon enough to an area where there are far too few safe and comfortable options for cyclists. Riders are invited to join Bike the Vote LA to canvass for Ramsay on Saturday. LA’s Mobility Plan 2035 goes before the Planning Commission on May 29th at the Van Nuys City Hall. The plan incorporates the 2010 bike plan, which has been gutted in some areas by a handful of city councilmembers, despite being unanimously approved the council in 2011. Evidently, unanimous votes don’t mean what they used to. Maybe they had their fingers crossed. You might want to consider showing up to tell the Planning Commission how you feel about that. If you ride PCH or the Malibu Hills, you owe it to yourself to protest the illegal mistreatment of cyclists by the motorists on the highway, as well as by members of the LA County Sheriff’s Department. Join Cycling in the South Bay’s Seth Davidson at Malibu City Hall at 9 am on Saturday, May 9th, or meet him at Will Rogers State Park to ride into the city as a group. And hopefully not get any tickets for not riding in the non-existent bike lane along the way. This has been an ongoing problem in the area, as bike riders work with the department to ensure fair enforcement, only to see new officers transferred in who don’t understand the basics of bike law, so the process starts all over again. And it’s time it stopped. It’s been a rough week for LA cyclists. According to a Facebook account, two bike riders training for the AIDS/Lifecycle Ride were mugged and robbed at gunpoint by three men on the LA River bike path Wednesday night. One of the riders was eventually able to get away, but the other lost his bike and cell phone to the thieves. Unfortunately, the account doesn’t say where it happened on the bike path. So be alert out there, especially at night. Thanks to Matt Ruscigno for the heads-up. Then there’s this case, where a cyclist definitely didn’t get a three-foot passing margin. In another Facebook account, a rider describes being passed by a vehicle so closely that the trailer it was pulling actually brushed his foot, scraping the side of his shoe — despite the fact that he was riding at the speed limit in a no passing zone. Needless to say, the driver refused to take any responsibility, instead blaming his victim for being on the road. Or maybe the planet. Thanks to Mike Kim for the link. A Santa Ana cyclist is in critical condition after he was right hooked by a large truck when he came off a sidewalk into the street, and was caught under the rear wheels of the truck. He was dragged about 200 feet before the truck came to a stop. As usual, the driver was not cited. Let’s catch up with the upcoming bike events. Don’t forget Ride On! Bike Day at Amoeba Records from noon to 4 pm this Sunday, benefitting the LACBC. All ages are welcome to the family friendly second annual Walk ‘N Roll Festival in Culver City this Sunday. The Eastside Bike Club is hosting a breakfast ride on Sunday to kick off Bike Month. Santa Clarita will host their free Hit the Trail community bike ride on Saturday, May 9th. The LA edition of the worldwide CycloFemme Global Women’s Cycling Day movement rolls on Sunday, May 10th, starting at the Spoke Bicycle Café on the LA River bike path. Tour LA’s iconic street art with the Eastside Mural Ride on Saturday, May 16th. Councilmember Jose’ Huizar calls for re-evaluating streets in Downtown LA to make them safer for bike riders and pedestrians. A new bike from LA-based Pure Fix pays tribute to the late rapper Notorious B.I.G., aka Biggie Smalls, and former NBA All-Star Rasheed Wallace. But could it support an extra large rider like Biggie? Santa Monica businesses can join in the city’s 2015 Commuter Challenge: Bike Month to see which company can achieve the highest CO2 savings by having their employees bike to work through May. Which just happens to be National Bike Month, as well as the start of the National Bike Challenge. Manhattan Beach residents raise a whopping 543% of their Indiegogo goal to market an affordable e-bike beach cruiser. The long planned two-way bikeway connecting Redondo Beach and Hermosa Beach should be rideable by Memorial Day. Advice on bicycling in LA County from a student at Biola University. Schedule your life around the TV viewing schedule for the Amgen Tour of California for the next few weeks. Needless to say, the women’s races won’t be televised — except for a one-hour 11 pm highlight show. So much for network support for women’s racing. Unbelievable. San Diego police are looking for a road raging truck driver who hit bike rider in the head with a hammer during an argument. I repeat, he hit a bike rider in the head with a hammer. Proof that bike helmets really do help. The San Diego Bike Coalition kicked off Bike Month a day early. Apparently, they were too excited to wait another day. A Modesto driver gets six years for a hit-and-run that seriously injured a cyclist while she was high on meth; somehow, she was still allowed on the road despite two previous DUIs. Sacramento considers putting more of their streets on a diet. I’ve said it before: It takes a major schmuck to mug a small boy and steal his bike, this time in Calaveras County. A proposed Merced bike path is the regional finalist in a $100,000 contest sponsored by Bell Helmets. San Francisco buses get triple bike racks, something we’ve been promised down here now that the law has been changed to allow them. A Marin equestrian says safely sharing every trail with bikes, hikers and horses is an illusion. Maybe so, but bike riders and hikers hardly ever poop on the trail. Bicycling lists 10 mistakes for beginner bike riders to avoid. A new bipartisan Safe Streets bill in Congress would give planners two years to adopt Complete Streets policies for all federally funded transportation projects. Denver bike messengers adapt to a declining market, while a London bike courier spills his secrets. Mountain biking ex-president Bush does his best Elvis impersonation while leading wounded vets across his Texas ranch on the first leg of a 100 mile ride. A Milwaukee writer discusses how to transport your dogs by bike. A Vermont website worries that Complete Streets safety improvements will make things worse for cyclists in the wake of recent bicycling collisions. Even though none of them had anything to do with Complete Streets. Bono still can’t play guitar five months after his bicycling spill in New York’s Central Park; it could take him another 13 months to learn if he’ll regain feeling in his hand. Baltimore’s hit-and-run bishop gets defrocked four months after the alcohol-fueled death of a cyclist. Wal-Mart isn’t responsible for the injuries suffered when a Mississippi boy took one of their bicycle-shaped objects for the spin through the store. A Florida rider discusses when to pack it in and call the SAG wagon. Advice on how to ride around the world from a Scottish rider who set a record doing it; a fellow world traveler writes about his plans to cross Australia by bike. Here’s something LA riders can relate to, as a hard-won Toronto bike lane is blocked by a film shoot. Canadian teens ride from Auschwitz to a Netherlands Nazi transit camp to commemorate the 70th anniversary of the liberation Holland. A UK rider is nearly garroted by an extended dog leash while riding on a bike path. Caught on video: This is why you need good brakes, as a Brit bike rider barely avoids becoming bus fodder. Also caught on video: The owner of a Dutch cat litter company converts his bakfiets into a kitty carriage for a 300-mile journey from Amsterdam to London. VeloNews asks if the Vuelta has lost its mojo. German police thwart an alleged plot to bomb a Frankfurt bike race; the race was cancelled in the wake of the arrests. Touring China by bike may be the best way to find clean air and quiet in the booming country; meanwhile, a 28-year old Pomona College student is honored for teaching Chinese people how to take control of their own lives by building bamboo bikes. If you’re trying to sell a stolen bike, try to make sure your coffee-drinking potential customers aren’t off-duty cops. An Indian cyclist credits his survival in a hit-and-run in part to his knee and elbow pads, while a badly injured Brit rider thanks his badly mangled helmet. Your next bike could be made of carbon fiber, ash and mahogany, though that wooden saddle looks a tad harsh. And you may never have to look up while you ride again; although personally, I’d be more impressed if it showed what’s behind me, instead. Thanks to Ed Ryder for the tip. One last note. I’ve been told about a possible bicycling fatality in Granada Hills on Wednesday, but haven’t been able to get confirmation; both the CHP and the LAPD’s Valley Traffic Division say they aren’t aware of anything. Let’s hope this one’s just a false alarm. The LA Times endorses Carolyn Ramsay in LA’s 4th district. Without ever mentioning the word bicycle. Evidently LADOT’s website got hacked. Or maybe someone forget to renew the domain registration for the 2010 LA bike plan, which now links to a spam site for rug padding. Thanks to Jonathan Fertig and Erik Griswold for the heads-up. Speaking of LA’s DOT, they are currently reinstalling the bronze plaques honoring the late Alex Baum, which had been stolen from the bridge named after him. That would have provided a good opportunity to hold along-delayed public memorial for LA’s leading, long-time and much revered bike advocate if the city cared to, which they evidently don’t. Rick Risemberg writes that you’ll now find bikes in every corner of LA, as the City of Angels slowly becomes a city for people. Looks like even bike-challenged USC will get a bike share program before LA. LA Magazine looks at the new seven-mile long bike lanes on PCH, which should be just the first of many in the ‘Bu. Let’s hope they help tame what has long been one of the area’s most dangerous roads. Kick off National Bike Month with Ride On! Bike Day at Amoeba Records on Sunset Blvd in Hollywood this Sunday; the afternoon event benefits the LACBC. The new California Streetsblog updates a couple of the proposed bills in the state legislature affecting bicycling, which are starting to look a lot better; Cyclelicious looks at some of the other nearly 40 bills currently before the legislature affecting bikes. SoCal agencies gather to fight the rising tide of drugged driving. Although I’m told the OC crime lab doesn’t even bother to test for some common prescription drugs that can seriously impair driving. As expected, the two men convicted of killing a developmentally disabled San Diego bike rider just for the hell of it have been sentenced to a well-deserved life with parole. An Antioch boy was injured when a motorist drove into the bike lane he and a friend were riding in to get around traffic; the driver was arrested when he collided with another car after fleeing the scene. Bicycling explains the problem behind the massive Trek recall, which could affect other bicycle manufacturers. Triathlete site Slowtwitch examines the dreaded speed wobble. Garmin sets out to challenge GoPro with an updated line of action cams. However, affordability doesn’t appear to have been high on their feature list. Denver police are using GPS enabled bait bikes to battle bike theft. A Wisconsin professor has written an academic history of the battle to give bikes a piece of the road. Life is cheap in Ohio, where fleeing the scene of a collision — leaving a critically injured cyclist lying in the street — and tampering with evidence to cover up the crime isn’t worth a single day behind bars. The New York Daily News says there is virtually no enforcement for bike riders who break the city’s law against riding on the sidewalk — except for the 10,000 people who were ticketed for doing it last year. The article also cites the 1,000 pedestrians injured in collisions with bicycles throughout the state each year, but fails to consider that maybe not all of the collisions were the bike riders’ fault. A Philly columnist takes the city’s new bike share program out for a ride. A video from Mobile AL demonstrates how to pass a bicyclist properly and respectfully. A Toronto writer says cycling is synonymous to socialism, and compares bike riders to smelt. Seriously? The owner of a Brit trucking company says cyclists are the worst users of the road, and truck drivers are the best. Sure, let’s go with that. A Scottish writer suggests balancing the country’s books by taxing “odious” middle-class activities like bicycling and jogging. Never mind that that taxing cyclists would be self-defeating, and many poor people bike. In fact, some people even use them to transport trees. Thousands of Scot riders Pedal on Parliament to encourage politicians to make the country more bike-friendly. Alejandro Valverde wins Liège-Bastogne-Liège for the third time, just days after winning his third La Flèche Wallonne. Smart idea. Finland fines law-breaking motorists more the more money they have. Tens of thousands of people turn out on two wheels to promote bicycling in Budapest. Now you can do your laundry while you pedal, as long as you don’t want to actually go anywhere. Brits are urged to be on the lookout for the “evil” bike rider who ran over the royal-in-law Chihuahua. And as every parent knows, it’s important to share bonding experiences with your kids. Like stealing bikes, for instance. Sometimes there’s justice after all. When a bike rider gets shot, it’s almost always gang involved in some way. The 2011 death of San Diego cyclist Jordan Hickey was the exception. The developmentally disabled man was just minutes from his home while riding back after visiting his girlfriend when he was gunned down for no reason. Or more precisely, just for the hell of it. Two men were allegedly driving around just looking for someone to kill when they spotted Hickey on his bike, and one leaned out of the car window to fire the fatal blast from a shotgun. On Wednesday, the driver, Juan Ignacio Gomez, was convicted of first-degree murder and conspiracy to commit murder; he faces life in prison without the possibility of parole. Humberto Emanuel Galvez, the accused shooter, faces a possible death sentence when he goes on trial in May. Which is exactly what he’s accused of sentencing Hickey to, without a trial. A feeder rider to tonight’s Griffith Park Advisory Board meeting will roll out from Sweet Salt in Toluca Lake to protest plans to open Mt. Hollywood Drive to cars to placate Beechwood Canyon homeowners, who are tired of being overrun by tourists looking for the Hollywood Sign. While I wasn’t looking, CD4 city council candidate David Ryu finally responded to the LACBC’s candidate survey; turns out like most bike riders, his remains in the garage most of the time. Carolyn Ramsay, his opponent to replace Tom LaBonge in the May 19th runoff, submitted her response back in February. LADOT offers up a Pico Blvd bike love story with a happy ending. Hollywood’s Amoeba Records is holding a charity auction hosted by comedian Kurt Braunohler on April 4th; proceeds will benefit the kids ride and activities at the LACBC’s River Ride in June. Expect rolling closures on PCH in western Malibu for the next two days as work continues on the highway’s Bike Route Improvements project. A Burbank writer looks back on Sunday’s Valley CicLAvia and asks what effect a similar event would have on the city. Ride for a great cause, as the Bear Claw Classic rolls this Saturday in Westlake Village to raise funds for Ride 2 Recovery. Clear registration stickers from California’s Anti-Theft Dots could help recover your bike if it’s stolen. Once again, the CHP rules harm, but no foul, as a driver escapes responsibility for taking his eyes off the road and seriously injuring a cyclist when his vehicle drifted to the right. Evidently, drivers are no longer required to pay attention and maintain control of their cars and trucks in California. Sad news from Sacramento, as a bike rider becomes the latest victim of a fatal hit-and-run. A San Jose writer provides a first-person account of simple solo fall with a not so simple result — multiple broken bones, collapsed lung and nearly a half million dollars in medical bills. San Francisco supervisors want more bike education classes in their districts. 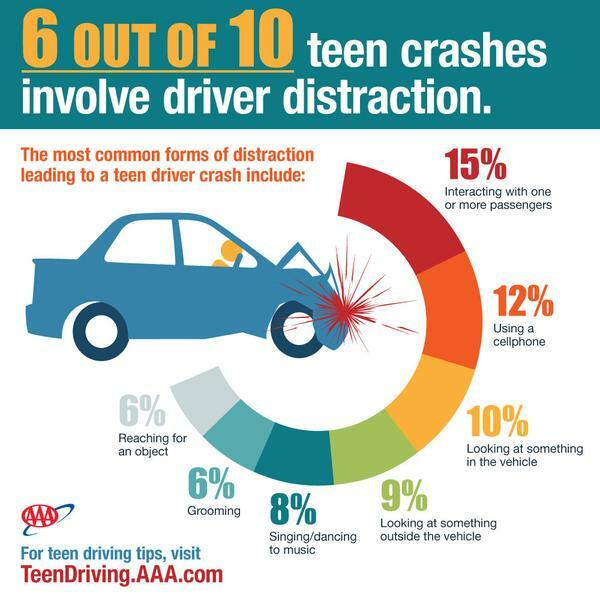 Dashcam video in a new PSA shows texting teen drivers swerving off the road; as the BAC’s David Wolfberg asks, how much of teens’ distracted driving behaviors did they learn from watching their parents? Denver prosecutors throw the book at a driver who nearly killed a bike cop while having a seizure; he faces up to 32 years in jail for crashing into the officer after hiding his medical condition when applying for driver’s license. A Houston website says it’s open season on bike riders in the Texas city following a horrific hit-and-run that left a cyclist critically injured. Good news from North Dakota, as bike collisions are down 50% in Rapid City. A 70-year old man who collapsed on the street can credit his life to the quick actions of a couple of Chicago bike cops. Whether a protected bike lane on a busy Boston street is a good thing or a bad thing depends on who’s telling the tale. Meanwhile, a Boston city councilor bemoans the loss of revenue from the 73 parking spaces that will be removed to make room for the cycle track, evidently valuing money over the lives of people on bikes. Baltimore plans to add up to 100 miles of bike lanes over the next 15 years; the question, as always, is whether the plan will be funded. A Florida driver faces up to 30 years in prison for the death of a bike rider; he was reportedly doing at least 102 mph at the time of the impact. The UK’s Cycling Weekly reminds us all why we got on a bike to begin with; however, they forgot to mention the most important reason. It’s fun. Formerly anti-bike Top Gear presenter Jeremy Clarkson rides off on one after being fired by the BBC for punching a producer; he faces possible criminal charges, as well. Caught on video: A first person view from the hero cyclist who chased down three British bike thieves. Dubai develops a specialized six-wheel ambulance — including bike rack on the front — to rescue cyclists injured while riding in the desert. An Indian official sets out on a “bicycle march” to end injustice, lawlessness and corruption in the country. Although he disappointed his mother, who wanted him to get married first. A Bangkok writer calls for his countrymen to stop using the term accident to refer to crashes, saying most, if not all, are preventable. You’re preaching to the choir, dude. After riding 5,000 from Los Angeles to Miami, then up to Charleston, a cyclist gets a ticket for unlawful passing — just one hundred yards from his final destination. That silly looking German adult balance bike is now a real thing, for no apparent reason. And how many times has this happened to you? Today is election day in LA, as well as several surrounding communities. I’d planned to write about the candidates running for the seat Tom LaBonge is vacating in Monday’s post, until the untimely death of Alex Baum — and yes, even at 92, he left us far too soon — took precedence. So let me just offer an endorsement of sorts for the two candidates I’d most like to see make it into a runoff. But let’s be clear on one thing first. I’m basing my choice strictly on those who bothered to respond to the LACBC’s candidate survey and participate in the recent Liveable Streets candidate forum. Simply put, if a candidate doesn’t care enough to ask for our support, he or she doesn’t deserve it. Of the 14 candidates in the race, only six meet both criteria. And of those, I prefer Tomas O’Grady and Carolyn Ramsay, with Sheila Irani coming in a not-so-distant third. Either of those two would make a great choice; ideally, both will survive to compete against one another for the seat in the June general election, ensuring bicyclists will have a strong voice to replace a very weak one from the district in City Hall. Meanwhile, the Times endorses Irani, while the Daily News picks O’Grady and Teddy Davis. And the LA Weekly calls the race total toss-up; with 14 candidates, the top two may only need a few thousand votes each to advance to the runoff. As for the races in other districts, I’ve previously announced my unqualified endorsement of incumbent Jose Huizar in CD14. For other races in LA and surrounding communities, check out the Bike the Vote LA voter guide. And the Times offers the rest of their endorsements, which for the most part don’t take bikes into account. LA cyclist and nutritionist Matt Ruscigno sends word of a friend of his who is still struggling to recover, physically and financially, from a devastating 2008 bike wreck that left him blind and with no sense of taste or smell. Mike Vincent is looking for donations to help pay massive medical bills and recover his sight. The Times addresses the death of Alex Baum, focusing primarily on his bike advocacy, while promising a more complete obituary to come. Meanwhile, Streetsblog’s Joe Linton offers a great remembrance of a great man. Downtown building owners are offering free bike rentals to tenants. A woman and her Schwinn were rescued from the LA River by Pasadena firefighters. KCET looks at LA’s recent literary ride. Traffic is only going to get worse in WeHo unless the city retools its streets for the future, including bike lanes. CLR Effect mourns the ghost of a poorly maintained bike lane. The California State Association of Counties endorses road diets; let’s hope our local electeds are paying attention. That proposed bike helmet bill could put a damper on San Diego’s new bike share program. Once again, Tour de Fat will bypass LA; the nearest stop is in San Diego. Seriously, they can have their damn football team if they’ll just give us Tour de Fat back. A Fresno cyclist is in critical condition after being hit by a car Monday afternoon; the out-of-control driver continued on to crash into a garage. A cyclist in San Mateo County is killed in an apparent solo crash. A Stanford blogger relates what it’s like to be hit by a car. Thanks to Erik Griswold for the heads-up. A San Francisco bike rider suffered life threatening injuries when he was hit by a car on Monday. Sheriffs deputies performed CPR for at least eight minutes until paramedics arrived; the victim was injured when the driver reportedly blew through a red light. One third of all Americans over the age of three rode a bicycle last year; 57% of the 103.7 million US cyclists rode for recreation. Hawaii police arrest one of their own for the on-duty hit-and-run crash that took the life of a Michigan bicyclist. Once again, a bike rider saves the day, as an Alaska cyclist rescues a blind dog who had been lost for two weeks on -40 degree weather; he also turned the reward over to a local animal shelter. Now that’s more like it, as a Casper WY man gets 12 to 16 years for the DUI death of a bike rider. A 76-year old Texas man bikes 300 miles for Planned Parenthood. It’s not that New York safety advocates want harsher penalties for killer drivers, as the NY Times says; it’s more like they want them to be charged at all. No apology from a New York truck driver three years after the death of a cyclist. Then again, any good lawyer would tell his client not to apologize, as it could be seen as an admission of guilt. The BBC profiles Britain’s Beryl Burton, arguably the country’s greatest female cyclist. Sad to see racial animosity rear its ugly head in South African cycling, although I have no idea what it was that the country’s first international pro cyclist was called. Aussie authorities reject calls to increase penalties for dooring in the wake of a cyclist killed after he was knocked into the path of a truck, while a writer calls for giving bicyclists greater rights on some roads. A Brisbane man is fed up with rude bike riders after one leaves him lying injured on a pathway. Seriously, there’s no more excuse for a hit-and-run cyclist than there is for a hit-and-run driver. A Vietnamese motorbike rider is killed escorting a women’s international bike race. Ford introduces two new e-bike prototypes that do not look like anything I would want to ride. I wonder if coating your bike in reflective sign paint would meet the state requirement for reflectors in all directions? And repeat after me: If you’re carrying two meth pipes and a stolen credit card on the $2000 bike you allegedly stole, don’t hang out in front of a cop shop.